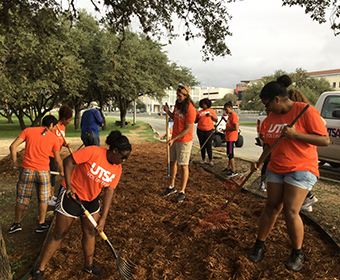 The UTSA community will participate in community service projects throughout San Antonio. (March 21, 2018) -- More than 1,400 students, faculty, staff, alumni and supporters of The University of Texas at San Antonio (UTSA) will make a difference in the community on Saturday, March 24 during UTSA’s Day of Service. The annual tradition, which will kick off a Year of Service by the university community, honors the inauguration of UTSA’s sixth president, Taylor Eighmy, and advances his vision for UTSA as an urban serving university. >> Watch a video on the importance of getting involved in UTSA's Day of Service. UTSA's Day of Service will begin at 8:30 a.m. in Bill Miller Plaza at the UTSA Downtown Campus. Service projects will begin at 9:30 a.m. and will continue throughout the day. UTSA's Day of Service will begin at the Downtown Campus with remarks from President Eighmy, First Lady Peggy Eighmy and San Antonio District 5 City Councilwoman Shirley Gonzales. Following a breakfast, volunteers will travel to various service agencies to participate in one of 30 community service projects throughout San Antonio. Learn more about UTSA's Day of Service. Get involved in other volunteer opportunities through UTSA.